Citizen science is an amazing hobby. You can learn about the natural world, meet fascinating people, and help make the world a better place. But it also gives you very powerful tools. Tools that can be used in many wonderful areas life. Such as discovering that the longest film nominated each year for the Best Film Editing Oscar is more than twice times as likely to win as any other films, and that the two longest nominated films combine to win 2/3 of the time. Obviously today's post is a little different than others. Instead of gauging water quality or tracking hurricanes, I'm looking at the Academy Awards. But this issue has nagged at me ever since 15-year old OpenScientist watched the three-hour long film "Dances with Wolves" win the award. While I enjoyed the movie in general, it was very long and meandering with large stretches containing lots of scenery and very little dialogue. It didn't even seem like there were many cuts in the film; instead it was filled with long single-take shots that never even needed an editor. Could it be that Oscar voters didn't understand editing at all, and just felt that long was equal to good? Today that 15-year old boy finds out. It turns out to be a relatively simple analysis. I pulled the names of all Best Editing nominees for the last 35 years from Wikipedia, and pulled their running times as listed by the Internet Movie Database (IMDB). I then ranked each film by it's length relative to the other nominated films (e.g., the longest film each year earns a "1", the shortest earns a "5") and also listed which of the films actually won that year. A spreadsheet with all that data is available publicly here. Before we see the results, why pick the last 35 years? Why not 20 or 50? Well, for starters I wanted a meaningful population of films in the modern era. Editing technology and film styles have changed over the years so there needed be some consistency. I also needed enough data points to make any conclusion scientifically reliable. But most important of all is that 35 years ago Star Wars won for Best Editing. The nerd in me just had to use that as my starting point. Now back to the research. Totaling up all the wins and rankings, we find the longest-running nominated picture each year wins Best Editing a whopping 44% of the time. That's three times more likely than any of the three shortest films nominated each year, and even twice the rate of the second-longest running film. Clearly being longer is powerful. Not only is being longest a powerful predictor of wining, but there is a clear connection between running time and likelihood of winning. At every step the longer a film is compared with it's competitors, the more likely it is to win. Why is this? Personally, I think it's because nobody understands what good film editing is. Even watching this clip featured on the Oscar web site doesn't really help us understand it. The best they say is good editing can be distinguished when the movie works (you aren't pulled out of the film), the character relationships make sense, and that performances are top-notch. Barely mentioned are things like the use of pacing to highlight the emotions of scenes, creating tension through cuts, or choosing to focus on a character's actions vs. focusing on the reactions of others around that character. Those are much more essential but even the experts have trouble defining them. Which brings us to the key point...academy voters just don't understand what they are voting on. Yet under the Academy rules (available here), voting is open to all Academy members. 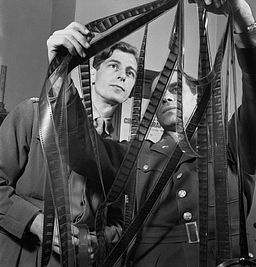 Many are actors, actresses, make-up artists, costume designers, etc., who have not spent any time behind a camera or understanding the editing process. They know good films, but really aren't experts outside their own specialties This is different than other technical categories requiring only specialists in those fields. There also is no rule requiring voters to have even seen the whole film. All this adds up to voters voting on something they have no understanding of and may not have even seen. So what do they do? They vote for the longest movie. To me, editing is improving by cutting. An editors job should be boiling down a film to it's bare elements (editing) and removing unnecessary camera shots or performances. But when the Academy rewards editors unable to do that, and encourages longer films with few cuts, it is just asking for overly long films told less effectively and less powerfully. All this leads to a final question...who will win Best Film Editing for 2012? According to the film's running length, it should be Zero Dark Thirty (clocking in at 157 minutes), followed by Lincoln (150 minutes), Life of Pi (127 minutes), Silver Linings Playbook (122 minutes) and Argo (120 minutes). And that's without even watching the films. Congratulations to the Argo team and their Best Editing Oscar. Not only did they win the adulation of fans, but they overcame the "Longest Film Curse" and actually won with this year's shortest film. I stand by the facts laid out above showing a clear preponderance of voters choosing longer films. 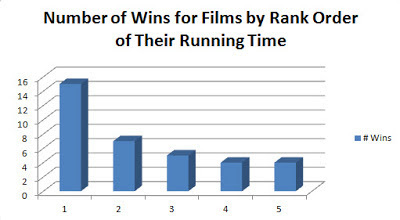 But statistics are not destiny, and sometimes films defy the odds. Over time I still expect the longer films will win. But only time will tell.